That’s the fairly new slogan of the Royal British Legion which I feel sums up what the Royal British Legion stands for today, and what we should remember. Tow agricultural college friends and myself walk together each year as a way of keeping in touch and have completed some of the UK’s long distance footpaths, Offa’s Dyke, Hadrian’s Wall and the Coast to Coast. 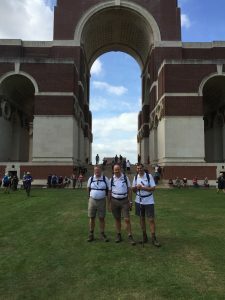 Just over 12 months ago we started the Southwest Coast Path and whilst sheltering from the persistent rain in a public house one of the friends spotted the “Western Front Trek 2018” and suggested it would be a good idea to sign up and do something memorable to help commemorate the centenary of the end of WWI, whilst raising money for the extremely good cause. Fast forward ten months and a Facebook page, “RAC Ramblers”, had been set up, together with a “Just Giving page, Andrewconey3”, and friends, relatives, business acquaintances etc., circulated and donations started to come in. After a period of “light” training, we set off with not a little trepidation to meet up with the other 65 participants in Greenwich, ready for an 8am departure on Tuesday 17th September, by coach and ferry, to Amiens. The target was to walk some 60 miles along the 1914/1918 Western Front from Amiens to Ypres, visiting a number of well known (and not so well known) cemeteries and memorable locations along the way. 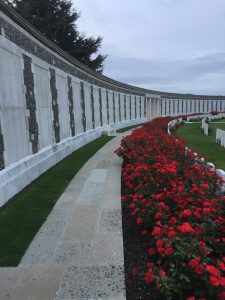 Starting off at dawn on day one we walked from Bray-sur-Somme Cemetery, taking in the Fricourt German Cemetery, the stunning Lutyens designed Thiepval Memorial, finishing at Beaumont Hamel, the Royal Newfoundland Regiment Memorial. 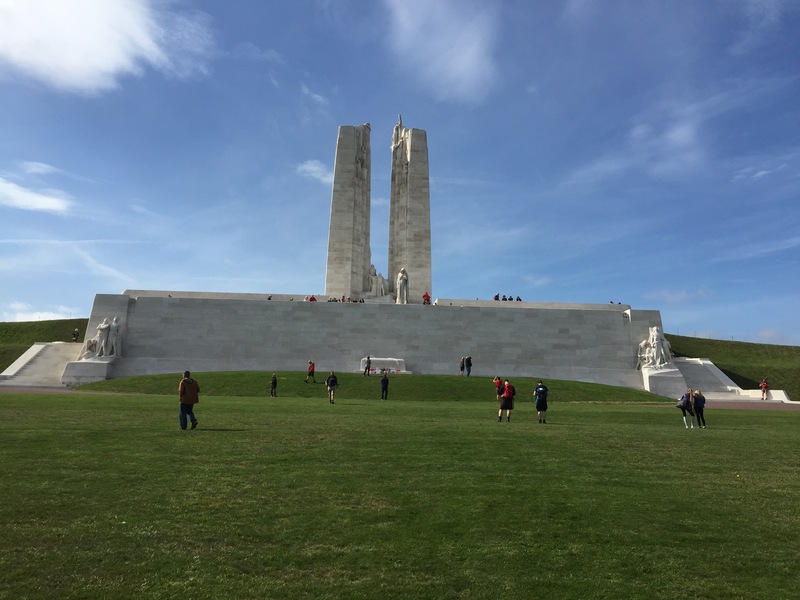 Day two saw us leaving the centre of Arras at dawn and climbing out of the valley to Vimy Ridge and the stunning Canadian National Memorial, finishing at Notre-Dame de Lorette “Ring of Remembrance” adjacent to the French grave of their “unknown soldier”. 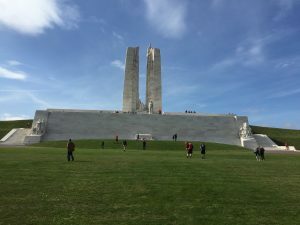 The Ring was mind numbing as it commemorates almost 580,000 soldiers who fell in the region, in alphabetical order and without distinction of nationality or religion. The fourth and final day started at Tyne Cot Cemetery, the largest commonwealth military cemetery in the world, where we had time to reflect on the sheer waste of human life, before moving onto Hill 60 and Hill 62, the site of the third battle of Ypres and Passchendaele. This lasted for three months and cost the lives of over a quarter of a million soldiers. 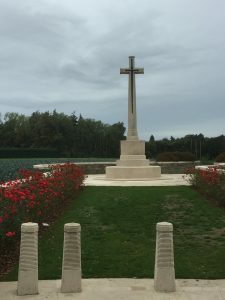 It became infamous, not only due to the constant German bombardment but the heaviest rain for 30 years, which turned the battlefield into a mud swamp so deep men and horses alike drowned in it. 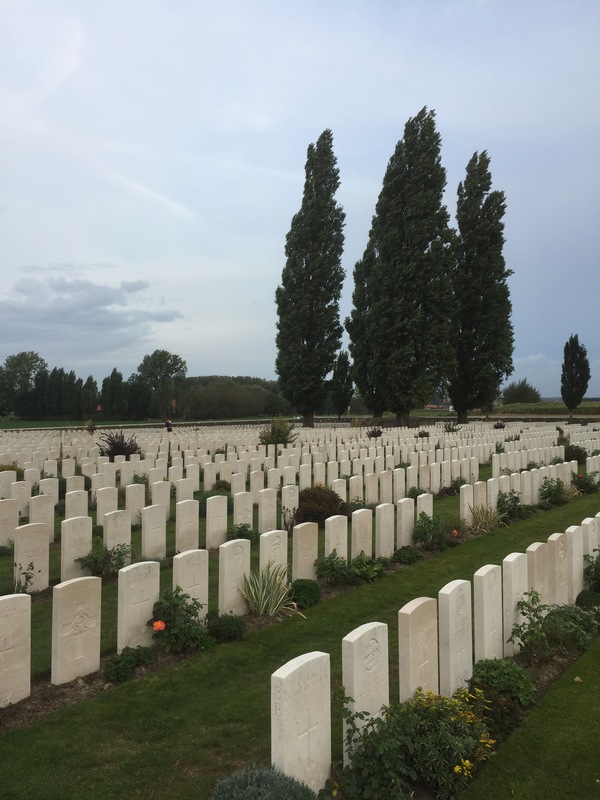 As can be imagined we made a rather sombre return to our accommodation for the night, before travelling back by coach and ferry to Greenwich, all of us being thankful that we were able to return to the UK, a privilege some 725,000 soldiers in WWI never enjoyed. We are well on our way to raising our £10,000 target, every penny donated going to not only commemorate those who made the ultimate sacrifice but those ex soldiers of today who are living with the physical and mental disabilities incurred on our behalf in conflicts all around the globe. It was an intensely thought provoking, sad, but at times uplifting experience that no-one who participated would have missed for the world and, without hesitation, were thankful that we had been part of. In its own way a fitting tribute to “Battles Over” a nation’s tribute, which is being commemorated all over the country. If you are able to contribute, donations can still be made by searching JustgivingAndrewconey3 and then going onto the RAC Ramblers link page and donating. Every penny raised will go to help an ex-service man or woman.